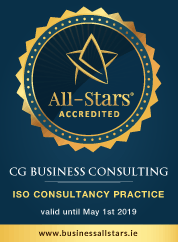 Your organisation could benefit from a FREE ISO 22000 Consultation with CG Business Consulting. What are the benefits of ISO 22000? What is ISO 22000 Food Safety Management System? The ISO 22000 Food Safety Management Standard is relevant to any business along the food chain such as animal feed producers, food producers, transport and storage operators, hotels, restaurants or retailers. It is also beneficial to companies involved in other food-related products such as additives, ingredients, packaging or cleaning agents. The ISO 22000 Standard is based on the most advanced technological, managerial and scientific expertise. It aims to create a level playing field across regional, continental and global markets by replacing divergent local standards with harmonized food safety management systems, benchmarked against best practices. By certifying your food management system to ISO 22000, you are declaring to potential customers and trading partners that you are able to meet the highest global standards of food hygiene and safety.